This class generates DHTML help tooltips that may appear over different types of Web page elements when the user drags the mouse over them. Screenreaders can switch the tooltips off (using a hidden link) and have meaningful title attributes for the corresponding web page elements. 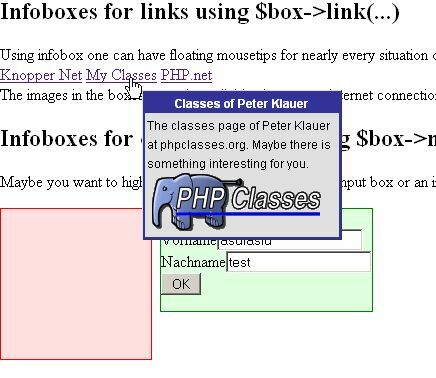 The class provides several means for associating tooltip messages to different page elements. The tooltip messages are defined in HTML, thus providing flexibility to the formatting of the messages that are displayed, which may include images and other formatting elements. 2006-07-18: Now the select-box bug is fixed with an iframe-hack!